View our pages in your own language! Existing clients log-in page. We upload fresh new designs every month for our valued clients. 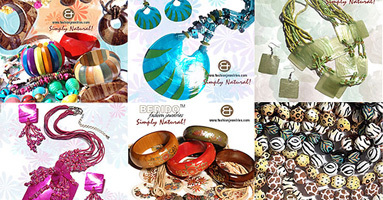 Welcome to Bedido Fashion Jewelries Inc.! We are a leading manufacturer and exporter of local handicraft, shellcraft, decors, fashion jewelry / jewelries and gift items, components and fashion accessories, based in Cebu City, Philippines. We are proud of our beautiful fashion jewelries made from a variety of indigenous materials which are mostly found in the Philippines- Shells,Coco, Bone, Horn, Wood, Mother of Pearl Jewelry (MOP ) etc... Jewelry components available in different cuts - Troca, Heishe, Natural, Special Cuts,Nuggets, Square Cut etc.. It's all about capturing nature's wondrous beauty, enhancing it and making lovely fashion jewelries that showcases Mother Nature's treasure chest! These jewelries come in a variety of colors you may choose from. Feel free to browse our site. You may also download our catalogue upon request We bring to you beautiful jewelry designs that's both contemporary and classic. Bedido Fashion Jewelries offers a wide variety of original jewelry and customized jewelries at a very competitive rates, specially for wholesalers. Visit our FAQ page for answers to your questions or you may send us an email . Shell Jewelry - From Shell Necklaces, Shell Bracelets, Shell Beads, Shell Dangling Earrings, Shell Pendants, Shell Bangles, Shell Components made of MOP Mother of Pearl Shell Hammer Shell Black Lip Shell Brown Lip Shell Black Tab Puka Shell Cowry Shell Cowrie Shell Bonium Mongo Capiz Shell Paua Abalone Shell. Great for Ladies Mens Boys Girls Ladies Wear. Wooden Jewelry - From Wooden Necklace, Wood Bracelets, Wood Beads, Wood Dangling Earrings, Wood Pendants, Wooden Components, Wooden Bangles. Made of Bayong, Robles, Camagong, Black, White Wood, Natural, Bleached, Ebony, Kamagong, Nangka, Round Beads, Oval, Flat,Chunky, Chunks, Nuggets and whole lot of unique shape and design wood jewelry. Resin Jewelry - Unique Designs of Resin Necklaces, Resin Pendants, Resin Bangles, Resin Earrings. Bone Horn Jewelry - Tribal Ethnic Native Designs Jewelry. From Bone Horn Necklaces, Bone Horn Beads, Bone Horn Anklets, Bone Horn Earrings, Bone Horn Pendant. For the Animal Instinct in you! Download our Digital Catalogs for the convenience of offline viewing w/ reference on cost . REQUEST A CATALOG NOW ! Catalogs are updated on a regular basis.. If you have any questions about our products and services, we offer 24 hour live assistance. Did you know that Caviar, also known as Food of the Gods is best indulge straight from a mother-of-pearl spoon since metal will give the eggs a tinny taste. a subsidiary of BEDIDO TECHNOLOGIES INC.